Disregarding the famous castle, cathedrals, market square and university, one could still spend years of their life (how many has it been now?) wide-eyed wandering the side streets of Kraków, tripping on cobbles, taking in every architectural detail, every subtle flourish on every facade. Rhinoceroses, roses, elephants, eagles, peacocks, pears and ships with dropped anchors are just some of the many emblematic additions Cracovian architects have affixed to the facades of the city over the centuries in an effort to make each tenement unique and distinguishable from its neighbours; in fact, these embellishments essentially served as addresses in the days before building numbers and street names - a relatively modern innovation that didn’t take hold in Europe until as late as the mid-18th century. 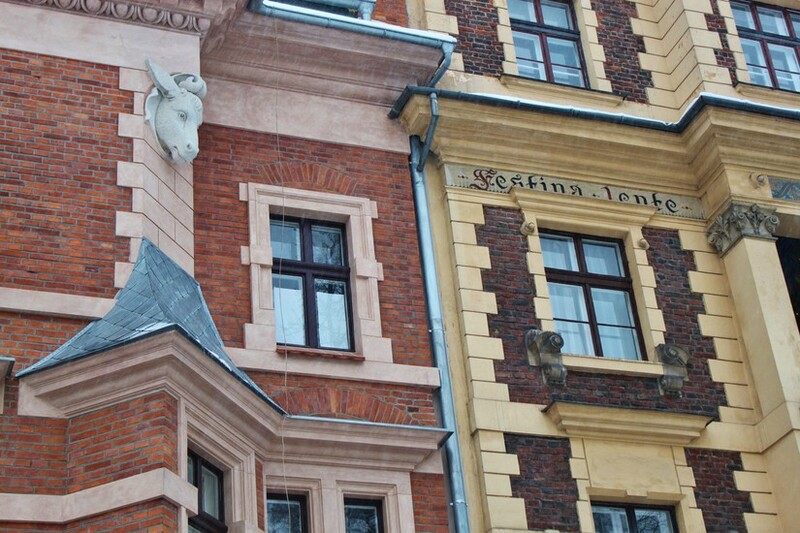 Visitors to Kraków today will notice no shortage of buildings and businesses that still go by the medieval monikers established directly as a result of the decorations on their facades - Pod Jaszczurami (Under the Lizards, Rynek 8), Pod Baranami (Under the Rams, Rynek 27), Pod Aniołami (Under the Angels, ul. Grodzka 35), and so on. Some of these architectural details are quite subtle, while others are spectacularly strange and even whimsical, which brings us to one of the city’s most brilliant and unsung architectural talents, Teodor Talowski (take a bow Sir, this is your moment). Born in 1857 in the small village of Zassów (today Zasów, north-east of Tarnów), Talowski attended school in Kraków before moving to Vienna and then Lviv, where he completed a masters in architecture. 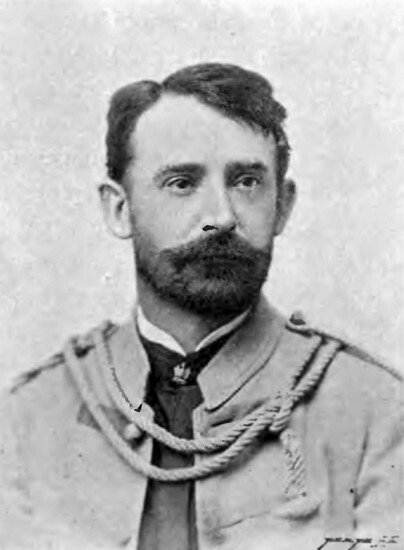 In 1881 he returned to Kraków, becoming a professor at the Technical University, and produced the most definitive works of his career here towards the close of the 19th century, before returning to Lviv in 1901 for a teaching position at the Polytechnic. 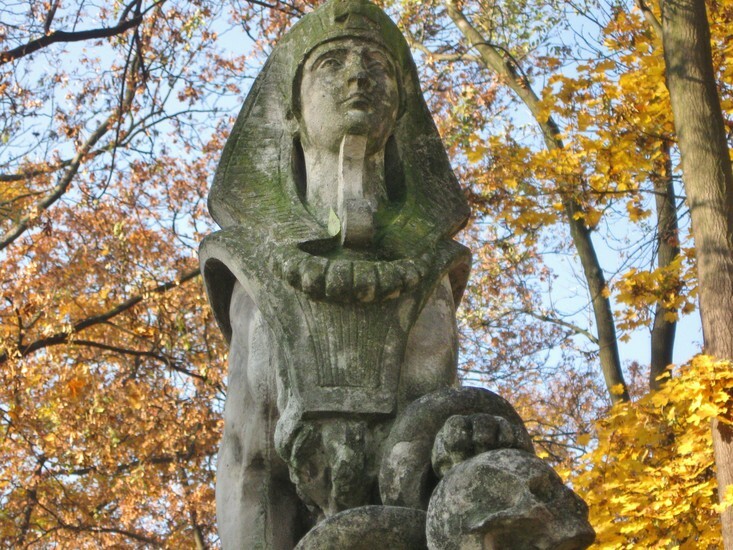 After a long illness he died in 1910 and was buried in the family mausoleum in Kraków’s Rakowice Cemetery; the elaborate tomb, which he designed himself, features a large sphinx clutching a skull under its paw. 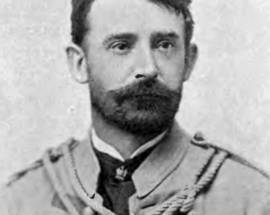 Though he was never recognised abroad, Talowski was a popular and prolific architect responsible for hundreds of highly original buildings (including countless churches, chapels, tombs, public buildings, tenements and villas) across Galicia at the end of the 19th century as he worked and travelled between the Austro-Hungarian province’s two largest, most important cities - Kraków and Lviv. 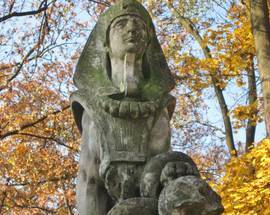 In Kraków, two of his largest and most visible works are the handsome Bonifratów hospital (ul. Trynitarska 11) in Kazimierz, and the ul. Lubicz railroad viaduct, which you may have walked across on your way to or from the train station. 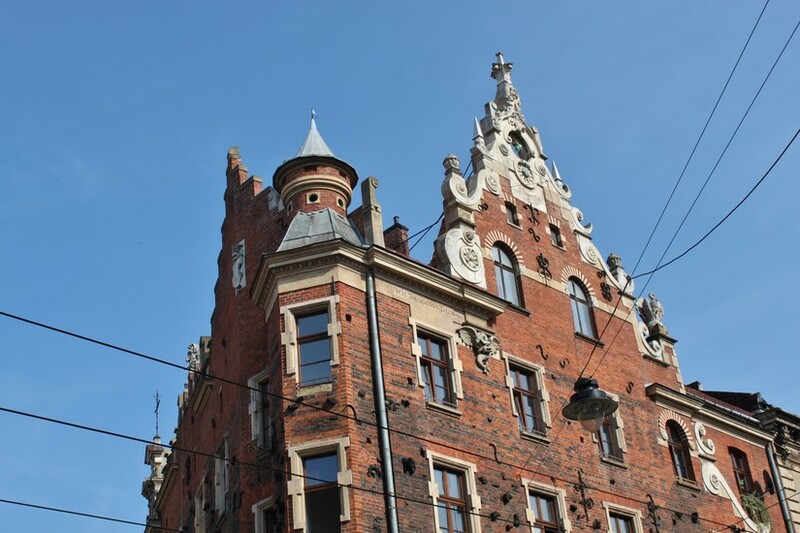 However, Talowski is best-remembered today for his weirdly asymmetrical, slightly whimsical apartment houses, of which he designed at least 16 in Kraków. 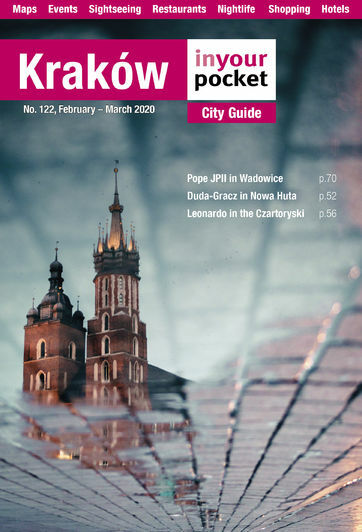 Generally defying stylistic categorisation, Talowski’s unconventional creations connected several architectural movements, incorporating elements of art nouveau, historicism, mannerism and modernism. In an attempt to place Talowski’s work within the recognised canon of architectural movements, he eventually became known by scholars as the founder of ‘eclecticism’ – an equivocal catch-all term for maverick architects whose work combined a variety of historic influences. Sadly for its founding father, however, eclecticism - owing to the very basic, but unspecific nature of its definition - proved to be a rather useless term in the art world and never caught on as an architectural movement, perhaps further validating Talowski’s vision as uniquely his own. 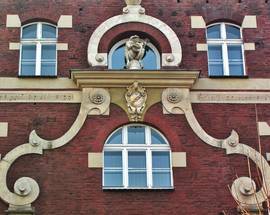 His use of fantastic ornamentation and inscriptions, asymmetry, irregular stripes of stone or plaster and the use of a particularly dark brick with ceramic pocks and bulges, all make Talowski’s facades easily identifiable. (The bricks in fact were made at his own factory, the recipe for which he apparently took to the grave). Fortunately for the fatigued, walk-weary tourist, seven of Talowski’s tenements lie in an easily admired cluster on or around ul. Retoryka and don’t deserve to be overlooked. One of the unique things about Kraków’s architecture is that it evolves chronologically in style through the eras as you walk in any direction away from the nucleus of its 13th century market square to its outlying districts. In this case, to get to the end of the 19th century, head west to the corner of ul. Piłsudskiego and ul. Retoryka, where Retoryka numbers 1, 3, 7, 9 and 15 all bear the askew stamp of Talowski’s genius within only two city blocks. On the southwest corner at ul. 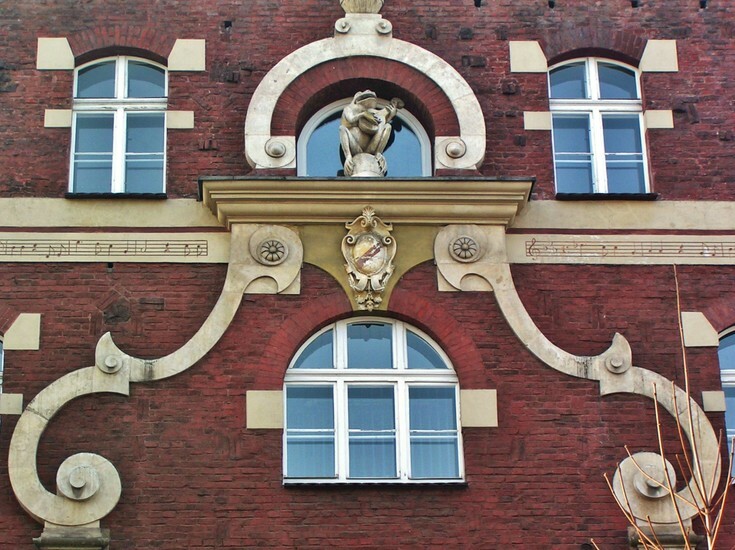 Retoryka 1, you’ll find one of Talowski’s most famous buildings, ‘Under the Singing Frog.’ In the pre-Kermit days when it was built in 1889, a tributary of the Wisła ran through the middle of Retoryka’s green median, which was apparently full of ceaselessly chirping frogs. Asked to design a new music school, Talowski placed his iconic ukulele-playing frog at the top of the facade, flanked by stripes of sheet music, in homage to the croaking heard around the area. The ornate peaking facade of neighbouring ul. Retoryka 3 was built two years later in 1891. Upon reaching the end of the block, make sure to hang a right and get a look at Teddy’s treatment of ul. 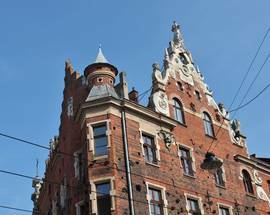 Smoleńsk 18 and 20, where an incredible bronze dragon menaces the facade of number 18 (built 1889). 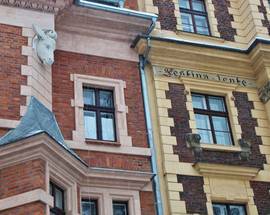 Returning to Retoryka, you’ll find one more of Talowski’s buildings at number 15 (built 1888). 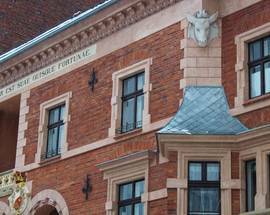 One of the architect’s more understated efforts, it bears the small, subtle inscription, this time in Polish - ‘Długo myśl, prędko czyń’ (Think long, act swiftly). 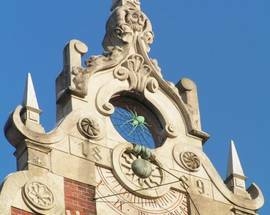 And finally, though it’s neither a hop, skip, nor jump away, we can’t conclude without mentioning ‘Under the Spider’ – perhaps Kraków’s most bizarre building and Talowski’s personal residence. At the corner of ul. Karmelicka and ul. Stefana Batorego, ‘Under the Spider’ was built in 1889 and features Talowski’s signature asymmetry and irregular stone and brick work, as well as special channels in the facade for woodbines and wild grapes to take hold and a winged dragon under an inscription of the architect’s name. 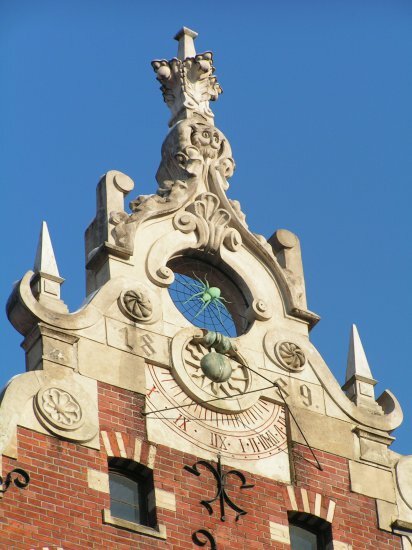 Meeting at a forty-five degree angle the building possesses two peaked facades, the one which overlooks Karmelicka street being the site of Talowski’s most eccentric stroke. At the summit of his personal home, Talowski placed a concerned-looking cat (we think) above a large porthole with a bronze web and attendant spider at its centre; directly below the porthole is a sundial, while perched nearby is a turkey (of all things). 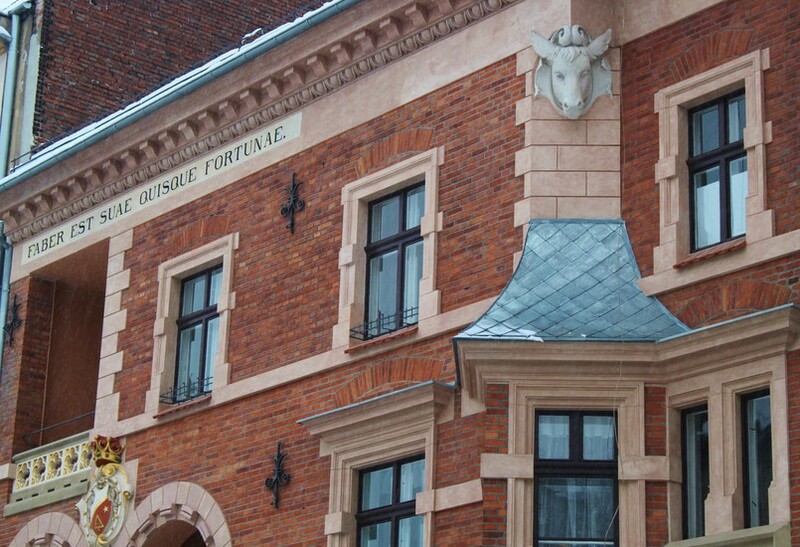 It’s arguably the most imaginative building in town, though the surreal symbolism Talowski has woven here is quite frankly lost on us; in fact the more we struggle to unravel it, the more we find ourselves enmeshed in its mystery….